As a mom of two sons in college now, I’ve been looking back and asking the question, “What would I do differently?” I even asked some other veteran homeschool moms to answer the question too. Most of their answers had nothing to do with academics. For me the answer to “What would I do differently?” in the early years is simple. Did my answer surprise you? Normally you hear people talking about relaxing, enjoying their kids while they were little, and not worrying so much about academics. So why would I say “do more”? Because I now recognize that what we did sometimes was what was really the most effective. 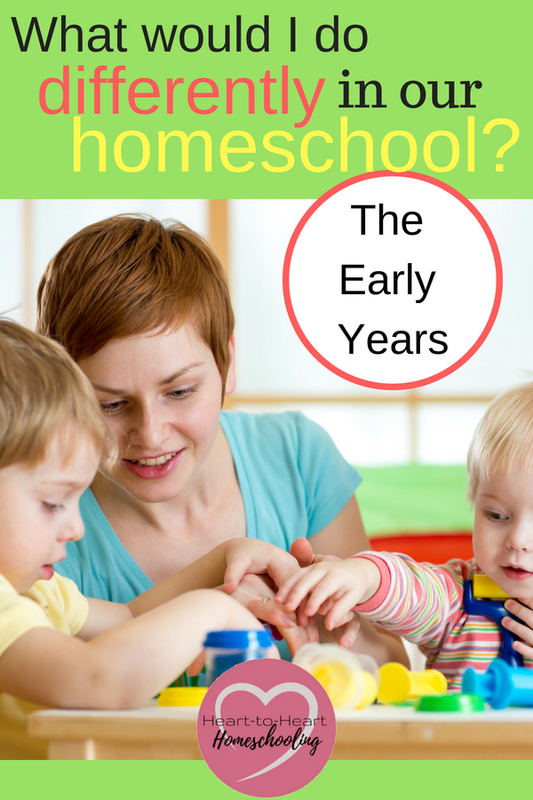 Every generation of homeschoolers sees a particular curriculum recommended by all their peers. I listened. I bought. We did. And it is one thing I regret. My boys never liked math, but I don’t believe it had to be that way. I can’t help but think if we had taken a different approach they would have enjoyed it more when they were young, had a better grasp of the concepts, and developed the ability to think mathematically. Perhaps it still wouldn’t have been either one of their favorite subjects. But maybe it would have at least been better. We would learn it naturally. I would take them to the grocery store and have them count things and weigh the fruits and vegetables. We would hang a calendar in the house and point out the days and weeks. And I would get a clock with actual hands on it to learn to tell time. There wouldn’t be worksheets or even many things written. We would lay a strong foundation of understanding through hand-on, real life things first. Every book, every popular curriculum seems to emphasize teaching history chronologically. But guess what? That idea isn’t actually based on what we know about children’s developmental stages. You’ve seen it before in your own homes. Your child tells someone a detailed account of what happened “yesterday” though you know it was several weeks ago. They just don’t think the way we do. Their concepts of time aren’t as developed. What research tells us is that younger children learn best through seeing, hearing, and touching. When learning is based on something they’ve experienced or know. The closer it its to “home” the better they get it. Does that mean they can only learn about the things right in front of them? Of course not. But even though they may enjoy stories from Egypt and Greece and Rome…they are simply that. Stories. Though I would have done more in math, science, and history, there are a few things I wouldn’t do at all. I wouldn’t be concerned with choosing a boxed curriculum. Yes, it was convenient, but I could have saved so much money (and space) if we had simply used the library more—the books and the programs. And even though I would have done “more” in subjects like science and history in the ways listed above, I wouldn’t worry about doing them every day. I might spend a week doing experiments if that is what they were interested in at the time. Or perhaps done a couple of days each week in those areas. I would have centered our learning around their interests. Yes, we still would have worked on phonics and spelling and handwriting. And of course we would have made reading aloud a priority (which they LOVED! ), but the majority of our time would have been more active. I would have been on the floor with them more and played more. We would have gotten messier. And I would not worry as much about sitting down to “do school”. We would focus on laying a strong foundation. No, it isn’t that we didn’t do any of these things. Actually we did most of them to some extent. It is just that I would have done more. I would have homeschooled without fear, trusted myself and my children more. Once you’ve decided to homeschool, it can be overwhelming. There are so many philosophies, methods, and resources available. I’m so thankful for those choices, too. 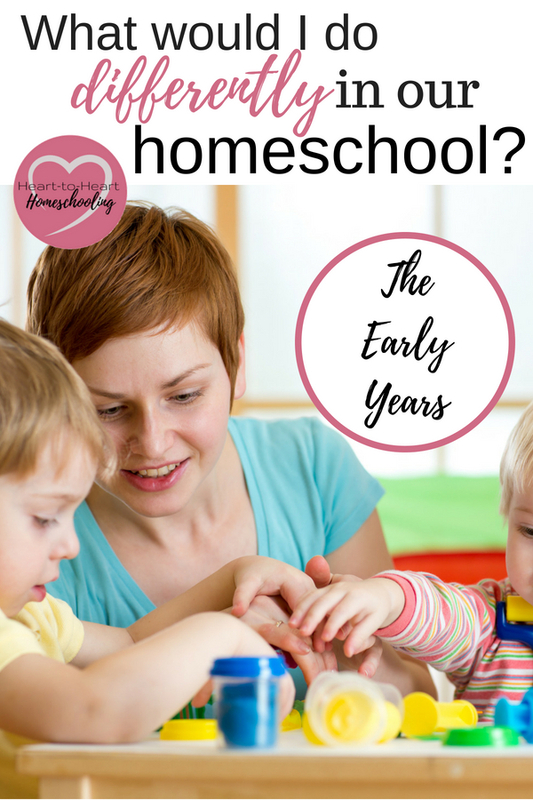 But when you begin homeschooling, know that the early years don’t have to cost a lot of money or take a lot of time or leave you feeling stressed. You can do more by doing less “school”. I agree completely. I am in year five but we didn’t start until the beginning of his fourth-grade year and I still completely agree. Hands-on learning has the deepest impact, sticks in their memory, and it is a whole lot more fun. The more the better. There are a lot of ways to teach the same concept, it doesn’t have always have to come from a textbook, and it shouldn’t. Creativity and imagination, plus hands-on real-life education work best for us! We will take more of that! Yes! There are sooooo many ways to teach 🙂 Thanks!